A romantic Florida Beach Wedding offers a lifetime of memories! A Florida Beach Wedding offers memories that last a lifetime! 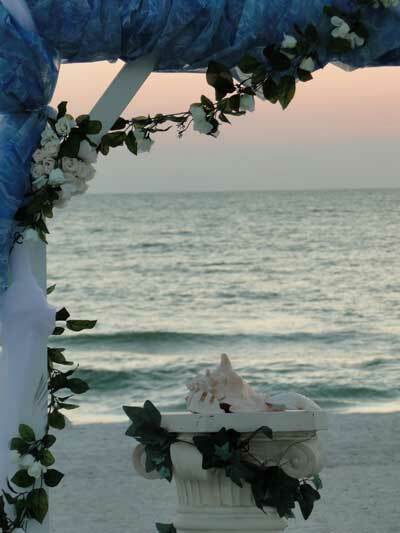 Consider planning your wedding on Anna Maria Island. Anna Maria Island has much to offer couples. From small ceremonies to large celebrations, Anna Maria Island has quickly become "The Wedding Spot in Florida." For couples to begin a life together. Beach weddings are unique in many ways. Where else can a few "surprise guests." Such as dolphins, sea turtles and wild birds join in on your special day? This doesn't have to be just a dream wedding -- it can be a reality for your special day or elope and a have a quite relaxing island Honeymoon! Florida requires a license to legalize a Marriage. Obtaining the Marriage License is the responsibility of the bride and groom to-be. Both parties need to sign the application in person. Call the local town or city clerk's office in which you plan to marry to find out where to go. The exact requirements may vary, but proof of identity is always required. This can be in the form of your driver's license or your birth certificate. There is no waiting period after applying and before receiving your license. For Florida residents there is a three day waiting period after your receive your license. This can be waived by both parties taking a four hour course. There is no waiting period for non-residents. Florida does not require a blood test. For general marriage license requirements this is only for general information only. Remember, this is no substitute for calling your town/city/county clerk's office. Find out the specifics and don't wait until the last minute. One last thing...you'll most likely have to pay the license fee in cash. You're better off not having to deal with waiting for your check to clear. Most don't accept personal checks anyway. Cost of License - $88.50 (May vary within state) $56 if couple takes 4 hr course. Once you have your license, you can get married. After the ceremony, both spouses and the Officiant must sign the marriage license. The Officiant then files for marriage certificate. You will receive the original marriage certificate by mail. This usually takes two to three weeks. You will need extra copies of the marriage license if anyone decides to change their name. You must provide an original copy for official name changes with Social Security.